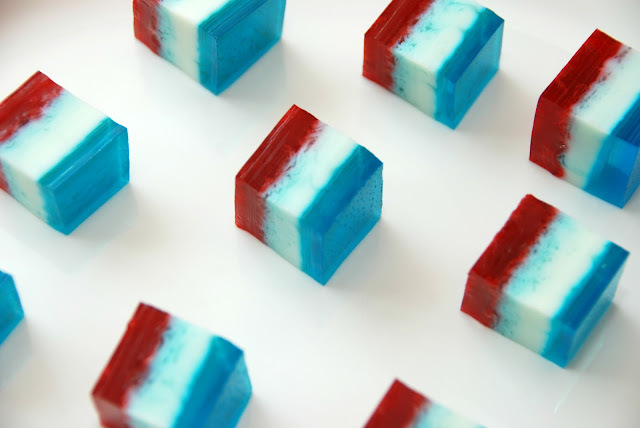 I have shown you some adult patriotic jello shots here, but nothing kid friendly. Let's face it, when kids see adults with something they want it too. That is why whenever I make adult jello shots, I make something jello-ish that kids can enjoy too. Prepare a 9"x 13" glass dish by lightly spraying it with cooking spray. Mix blue jello, Knox gelatin, and boiling water, until powders dissolve. Pour the mixture into the 9"x13" dish. Place the dish into the refrigerator until gelatin is set (approximately 25 minutes). It is ok if the gelatin is slightly sticky to the touch. Mix gelatine, and 3/4 cup boiling water, until powder dissolves. Stir cold water into the mixture. In a separate bowl mix sweetened condensed milk, and 1 cup hot water. Pour the milk mixture into gelatin mixture, and mix to combine. Slowly pour the milk mixture on top of the set blue layer. Return the dish to the refrigerator until gelatin is set (approximately 25 minutes). It is ok if the gelatin is slightly sticky to the touch. Mix red jello, Knox gelatin, and boiling water, until powders dissolve. Stir the cold water into the red mixture. Slowly pour the red mixture on top of the set white layer. Return the dish to the refrigerator until gelatin is set (approximately 25 minutes). At this point I left it covered in the refrigerator overnight. The next day I cut it into little squares. You could use cookie cutters to cut stars or any other shape you would like. Loved this and pinned it. I'll have to try them later in the month for our state holiday!